How is a Workers Compensation Hearing Scheduled in Iowa? How is an Iowa Workers Compensation Hearing Scheduled? Under the Iowa Workers Compensation rules, within 120 days, but not less than 60 days after a petition is filed the attorneys for the parties or pro se litigants if they are not represented by an attorney, shall contact the hearing administrator to set a time, date and location for the hearing. Often the hearing will not occur until 12 months or longer after a petition is filed. Hearings can occur in the judicial district where the work injury occurred or in Des Moines (Polk County) by agreement of the parties or if the injury occurred outside of the state of Iowa, but there is still jurisdiction under Iowa Workers Compensation laws. Where Will the Hearing Occur? The venues outside of Des Moines include Cedar Rapids, Council Bluffs, Davenport, Iowa Falls, Ottumwa, Sioux City, and Waterloo. There are 12 workers compensation judges here in Iowa that all live in the Des Moines area and have offices in Des Moines. They travel to outside venues and often hear multiple cases over a period of a few days. Keep in mind that if your case is set in one of the venues outside of Des Moines, you will have both a backup hearing date and primary hearing date. This is because if a case settles just before trial, then the back-up hearing then becomes the primary hearing. Sometimes, the parties only find out 24 to 48 hours before the backup date that they will be having the hearing because the case before theirs settled. 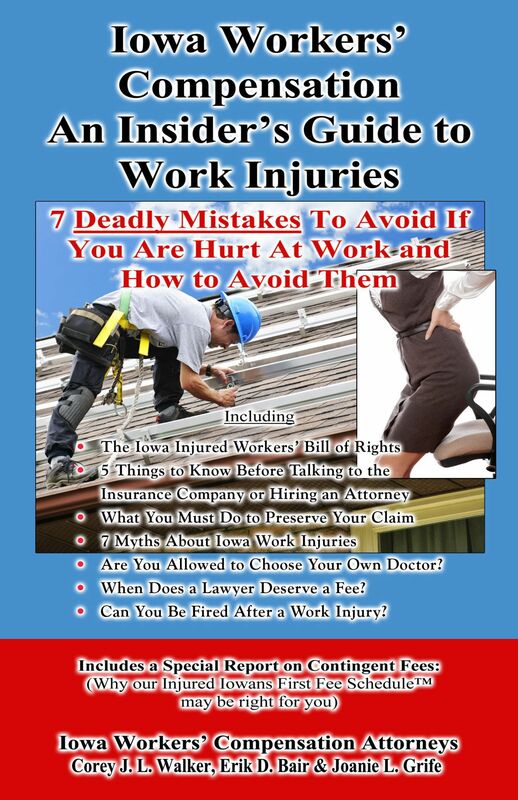 For more information about Iowa workers comp cases, if you are not currently represented by an attorney, then request your copy of our Iowa Workers Comp book which includes 7 Deadly Mistakes to Avoid if You are Hurt at Work and much more. To receive your Free book, Call Now 1-800-707-2552 (ext. 511) (24 Hour Recorded Message) or log onto www.IowaWorkInjury.com. Why offer a Book at No Cost? Iowa Workers' Compensation Attorney Corey J. L. Walker practices primarily in workers' compensation law and has represented hundreds of Iowans hurt at work and has seen too many clients from Des Moines, Newton, Cedar Rapids and throughout the state of Iowa make mistakes before they had the “right” information about work injuries resulting in them losing thousands of dollars. Iowans hurt at work are beginning to realize that the insurance company is not there to help them and that they should have someone on their side. Finally, you can learn about work injuries in the comfort of your own home with no cost, risk or obligation. For immediate assistance call 515-440-2852 and ask for Corey or Erik.